Photo by uncle Jut Tony Santoro (left) and Marquell Pettiford hold cups of brewed Enderly Coffee. 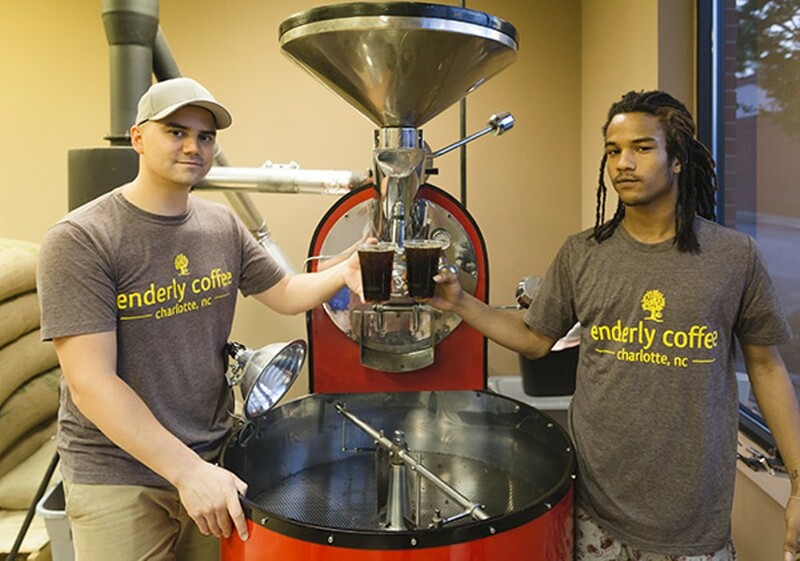 If you're wondering why the name Enderly Coffee sounds familiar, it's because you've probably seen a sack of its beans around town — at the Healthy Home Market, Tip Top Daily Market, Juice Bar or Hazelnuts Crêperie. And if you're wondering where Enderly Coffee's shop is, you're not going to find it — not until this summer, that is. Enderly plans to open its first actual coffee shop close to its namesake neighborhood — Enderly Park. Owner Tony Santoro says he's moving the roasting company from its current locatiuon in Echo Hills to a spot on Tuckaseegee Road not far from The Milestone Club. And it's there that he also will add the coffee shop. Santoro says he's aware that Tuckaseegee is not exactly the first location your average coffee shop proprietor would choose for a new business. But he's not your average coffee shop proprietor. Santoro is committed to social justice issues, using coffee he buys straight from farmers in other countries and employing kids from underserved neighborhoods. "Part of me gets very excited to pull people from different parts of the city into a neighborhood that's very different from theirs and allows them to just rub shoulders with people who are different than them," Santoro says. The new shop, he adds, will include wi-fi, food options and other beverages including teas and frappuccinos. 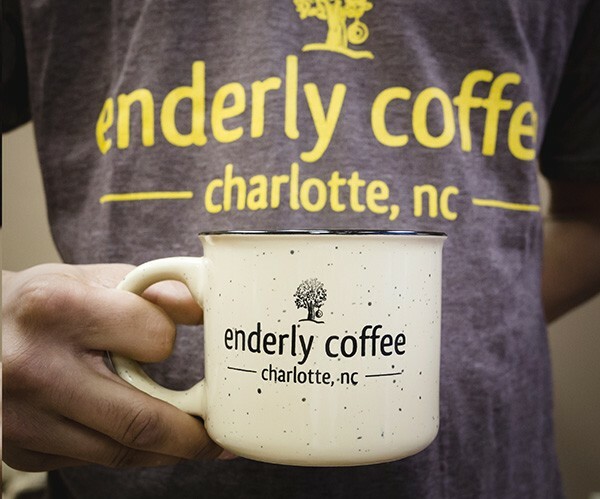 He hopes Enderly Coffee will be a space where the community can come together, whether it be for neighborhood association meetings or poetry slams. Santoro's obsession with coffee came long before he dreamed of opening his own roasting business. The 33-year-old says coffee has been a central part of his and his wife Becky's relationship since they began dating at Michigan State University when she was a barista. "We'd find ourselves a lot of late nights doing homework together at the coffee shop," he remembers. "When she was working I'd always come in the morning and get my coffee. So that was always like a sentimental spot for us." Before they opened the roasting business, the Santoros, who were school teachers at the time, would always make it a priority to try out local coffee shops' brews when traveling, and after fancy dinners they would order coffee instead of wine. "Not that we were snobs by any means," he says. "We just enjoyed it for what it was." The couple named their roasting business for the neighborhood they moved to when they first arrived in Charlotte. After looking at homes in up-and-coming areas of town, the Santoros decided on Enderly Park in order to stick with their Detroit dream of moving to a neighborhood where they could make a difference. "We wanted to do something intentional [in terms of] how and where we lived," Santoro says. "We wanted to build a community and be in a place that's not the trendy, gentrified place, so to speak." Another big deciding factor for the couple came when viewing a home in Enderly Park; future neighbors came over and were "super gracious," Santoro says. "The feeling between the house and between the people we met just felt right." After the recession of 2008, the Santoros' teacher salaries were affected by pay freezes, and the job Santoro loved began to become a financial burden. "I was in my seventh year thinking, 'OK, well, teaching's not my future. I need something, so what is it going to be?' At that time I was applying everywhere: I was looking at the banks — this, that and the other." At home, he was roasting coffee as a hobby. "I found out that you could do it at home in a popcorn popper," he says. "I YouTubed it, and then I tried it, and I could do it. I was like, 'This is cool.' So I started doing that more and more at home, and then I started selling some to our friends and family, and our church, Watershed, started buying it." A friend encouraged him to pursue coffee roasting professionally, offering Santoro a job that would allow him to get the business up and going. Santoro began buying his beans from big coffee importers, but as a small-business owner, he saw a need to support farmers directly rather than using corporate middlemen who hiked up prices and didn't pay farmers what Santoro thought they deserved. For the same reason he prefers local shops to Walmart, Santoro started buying more directly from farmers abroad. "For example, the Peruvian coffee I get, it's bought through this direct-trade company called Farm to Roast," Santoro says. "He's a guy up in Pennsylvania and he has a connection with a guy in Peru, and together they have imported a bunch of small-farm coffee. By buying it though their company instead of through a big importer, he verifies that the farmer is getting a dollar more per pound than fair-market value. So the farmer's getting more, there's less middlemen involved, I'm getting a fair price on it." He gets his Rwandan and Guatemalan coffees through similar relationships. For his Costa Rican coffee, Santoro partners with the Balzac Brothers from Charleston, S.C. "Cool story actually," he says. "The Brazil that I just bought from the Balzac Brothers – his grandpa used to buy from [that same farm] back in the early 1900s. They're actually bringing coffee from the same farm that his grandpa did 100 years ago!" Santoro works toward a socially conscious business model in other ways, too. 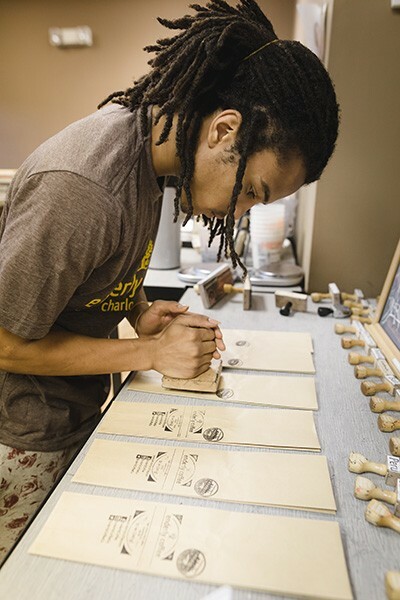 When his roasting company first began making money, he started supporting a neighborhood organization called QC Family Tree. "I wanted to start the company in a way where I could use it to do some good things in the neighborhood," he says. One tangible way has been to create jobs for local kids who have grown up in the neighborhood, like Marquell Pettiford, now 20, who says working for the roasting business has caused a life-changing shift in his attitude. Pettiford hand-stamps individual Enderly Coffee bags. "Since I've been working here I've been more focused," Pettiford says. "I feel like I'm important to something. Before, I wasn't as dedicated to things as I should be. Not just work, but school. I'm more passionate about things now. I'm looking more in depth about everything." Santoro's business practices have made an impact on Pettiford, who grew up in west Charlotte. "If I was spending money before, I was just going to spend it," Pettiford adds. "Now I'm really thinking about how it can affect people like me." Pettiford went to Harding University High School but did not complete his diploma. Since beginning work at Enderly, he has completed his GED at Central Piedmont Community College, and is now pursuing a degree in engineering and has bought his first car. Santoro hopes Pettiford will be able to gain skills he needs to be successful and go off to create his own life. When he opens the coffee shop, Santoro plans to employ more kids like Pettiford so the business can continue creating opportunities. He says he wants to "use the shop to make sure my money is staying in this cycle of improving people." All his life, Santoro says, "I didn't just want a job, I wanted to be a part of something." Now he's created something for others to be a part of.